At the dawn of the 20th century, river shipping on the Squamscott had declined to a trickle. In earlier times, the river was necessary to haul raw materials to town for the factories and mills. 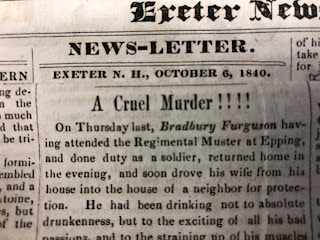 The Exeter Manufacturing Company shipped raw cotton up river and then sent finished cloth out to market. The Flagg and Wiswall paper mill brought in loads of rags to make into paper and the town's many merchants used the river to bring in goods from Boston. But by the mid-1800s, the railroad had taken over most of the transportation of goods. Newer factories were built on the western part of town clustered around the depot. The only materials shipped on the Squamscott were heavy goods — lumber, coal and bricks — that were still best moved by water. Harry Anderson didn't give up on the river. By the turn of the century, the town had developed an insatiable hunger for coal. Coal ran the steam machinery of the Exeter Manufacturing Company. It heated the homes, schools and public buildings in town. Exeter's Eagle Steamer fire engine pumped 7,000 gallons of water per minute through the use of a coal-fired engine. Anderson was well aware that the cheapest and quickest way to transport hundreds of tons of coal was by water. In 1893 he almost single-handedly revived river transport for a brief period of time. Anderson had a great love of sailing and put this to good use by bringing his coal supplies up river on schooners. 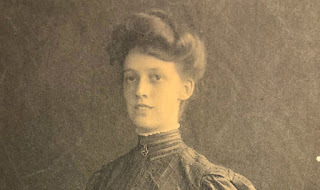 Nancy Merrill, in her history "Exeter, New Hampshire: 1888-1988," states that "at one time (he) owned five schooners home-berthed in Exeter." One was the Lizzie J. Call. Built in Portsmouth in 1886, the Lizzie J. Call had a regular crew of five, including the captain. During the six-month-long coal strike of 1902, she brought in the last load of anthracite coal; preferred for heating because it burned hotter and smoked less than soft coal. But even that load wasn't quite enough. "Schooner Lizzie J. Call arrived Saturday morning with 250 tons of broken coal for H.W. Anderson, her managing owner. It was bought the day before the coal strike, 300 tons not being available," wrote the Exeter News-Letter. During the next six months, only inferior soft coal was available and this was snatched up by the Exeter Manufacturing Company and the town. Anderson scrambled to purchase coal from Wales — but only at an increased price. When the Pennsylvanian coal miners finally resolved the strike in mid-October, it took another month before coal was available to householders. "They were peering through the mist when suddenly the vessel crashed onto the rocks off Winthrop at 12:30 Sunday morning and her masts nearly went by the board when she struck. She was thrown higher up on the beach by the tremendous seas, and the waves beat against her hull and dashed high into the rigging. The men on board were drenched to the skin, and they clung to the rigging to prevent being swept into the sea. "The vessel pounded so badly that her seams opened and she began to leak. The tug Leader happened along and seeing the predicament of the vessel ran down to render assistance. A heavy hawser was made fast to the vessel and the tug straightened out and pulled on her. After considerable tugging the schooner began to move and she was soon hauled into deep water." The ship had taken on so much water that even after her rescue from the rocks she was still in danger. The bilge pumps barely kept her afloat long enough to make it to port in East Boston. There she was repaired enough to make it home to Exeter. The Lizzie J. Call continued to travel up and down the Squamscott River until barges and trucks proved to be more efficient. Anderson sold his coal company to William McReel in 1910. McReel preferred to ship his coal from Portsmouth and Kittery, Maine by barge and the swift running schooners were no longer needed for long trips at sea. Once coal faded from use in the late 1940s, the days of dusty coal mounds piled alongside the river were over. 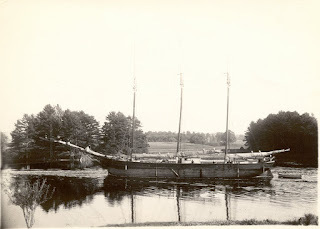 The days of the schooners on the Squamscott River were also over. Coal was also brought to Exeter by barges. Your oft quoted diarist Helen Tufts christened the barge "Merrill" in 1902 with roses and it survived a fire in Exeter in 1911.